According to Wikipedia, the rule of three is a writing principle that suggests that things that come in three are inherently funnier, more satisfying or more effective than other numbers of things. However, in recent years, scholars have been unearthing a mountain of evidence to suggest that the rule be downgraded to, at best, a rule of thumb, with the more militant scholars going as far to say it should be the curse of three, citing Hobbit films, the nephews of Donald Duck and Brontë sisters as key evidence. This month’s underwhelming fossil fish was once in three parts but has been stuck together using sticky back plastic and chewing gum expertly and still isn’t very interesting. 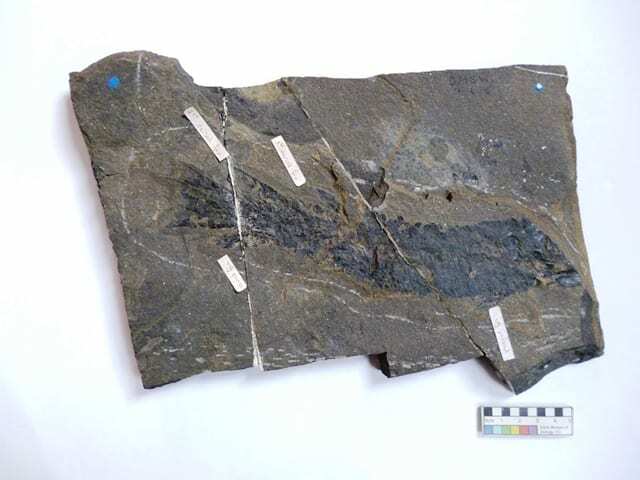 Tentative introduction over, welcome to July’s Underwhelming Fossil Fish of the Month, a monthly foray into the deeply dull and noteunworthy world of fossil fish from the Grant Museum collection. If I were you, I’d recommend going and making yourself a tea or coffee. That’s a much better use of your time. 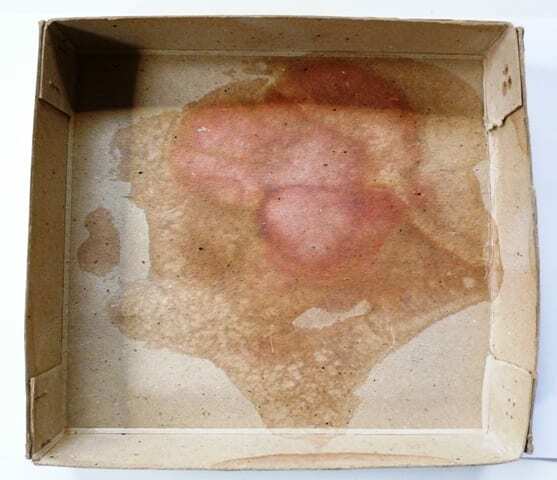 Before we get on to this month’s actual underwhelming fossil fish, the box for this month’s specimen is perhaps more interesting as it looks like a bit like a crime scene. The site of an Eldritch ritual by previous museum curators? The soul of this unholy fossiliferous triptych attempting to escape? Flood damage? It’s probably flood damage. Note to curator: replace box. What dark rituals went on here then? Here’s what the specimen within looks like. LDUCZ-V1558 Tristichopterus alatus note the helpful outline around the fossil and look at those horrible corners. Preservation Even before the modern museum additions of the scratched outline, sticky labels, paint splatters, actual paint and superglue this specimen wasn’t the prettiest. As regular readers know, I’m a fan of a nicely prepared corner but the bare minimum has been done here to tart this fossil up at all. The specimen has been split into three pieces by mineral veins and crucially the head is missing which most cultures consider the most interesting part of a fish. What is present isn’t preserved in too much detail, some of the skeleton of back of the head are preserved and the fins of the ‘lobe fins’ can be discerned. 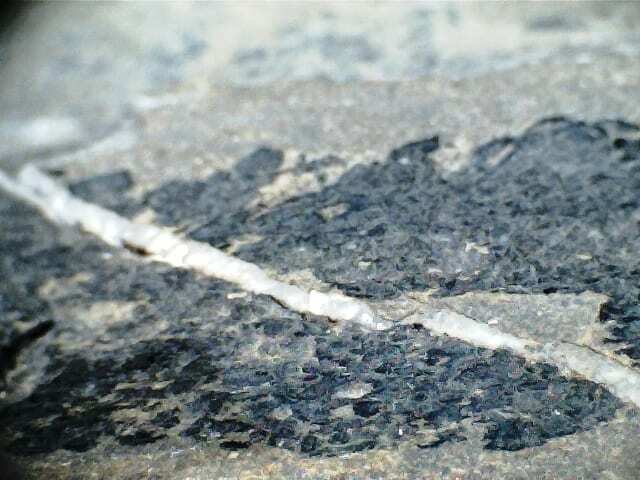 Unfortunately, not much of the skeleton or the scales can be made out, the softer body parts are preserved here as an amorphous layer of black. Here’s that amorphous structure made even less clear with the ever unreliable and disappointing but reassuringly cheap USB microscope. As an impressionist painting, this is quite dark in colour and tone. As a photograph of a specimen under magnification, this is naff. Research Initially I found a paltry handful of references about this species as the label for this specimen is Tristicopterus alatus missing an ‘h’. The valid name appears to be Tristichopterus alatus and a fair bit has been published on this species although it’s always in reference to how special and wonderful Eusthenopteron is by comparison. Ooooh the vertebrae in Eusthenopteron as so special (Whiteaves 1883). Eusthenopteron is so precious, lacking parapophyses and ribs on the anterior vertebrae (Garvey, Johanson and Warren 2005). Eusthenopteron is soooo much bigger and better than Tristichopterus (Coates, Ruta and Friedman 2008). Na na na na na! Tristichopterus doesn’t have three axonosts in the pectoral fin (Cope 1887). Eusthenopteron this (Westoll 1943), Eusthenopteron that (Thomson 1967). We get it. Jeez. In Society Have you heard? Eusthenopteron may be dating a leading boyband singer? Eusthenopteron looks amazing in a bikini on holiday in the South of France. Eusthenopteron is to be the new face of <BRAND AND TYPE OF COSMETIC>. Who’s the anonymous beau spotted on the arm of Eusthenopteron leaving <TRENDY LONDON NIGHT SPOT>? Eusthenopteron rumoured to be next child of William and Kate…. Garvey, J.M., Johanson, Z and Warren, A. 2005. Redescription of the Pectoral Fin and Vertebral Column of the Rhizodontid Fish Barameda decipiens from the Lower Carboniferous of Australia. Journal of Vertebrate Palaeontology. Vol. 25, No. 1 (Mar. 11, 2005) , pp. 8-18. Whiteaves, J.F. 1883. Recent Discoveries of Fossil Fishes in the Devonian Rocks of Canada. The American Naturalist. University of Chicago Press. Vol. 17, No. 2 (Feb., 1883) , pp. 158-164. Actually, I found the fish quite lively in a fossily sort of way. But the box … it has that inherent aura of face-huggerishness, a menacing, gelatinous mass with a hint of blobby Lovecraftian otherworldliness. There is almost a 3D effect to it. A doorway to another universe, where Pink Matter reigns supreme. Yes indeed. Don’t think about the box too hard Helen, lest the forces of darkness overcome your psyche.